SKY MAP: Scorpius in July as of 10 p.m. from mid-northern latitudes. The Scorpius constellation has intrigued people for centuries, not only for its distinctive shape, but also because it is one of the brightest constellations in the sky. The name is Latin for scorpion, or literally translated as the "creature with the burning sting." However, Scorpius is not a scorpion to everyone. The Javanese people of Indonesia call this constellation Banyakangrem, meaning "the brooded swan" or Kalapa Doyong, meaning "leaning coconut tree." In Hawaii, it is known as the demigod Maui's Fishhook. In Chinese mythology, the constellation was part of the Azure Dragon. In the Northern Hemisphere, Scorpius lies close to the southern horizon; in the Southern Hemisphere, it lies high in the sky near the center of the Milky Way. Best seen in July at 9 p.m.
Scorpius used to be larger. The ancient Greeks considered the Libra constellation to be the claws of the scorpion. Scorpius happens to be the location for several interesting exoplanets, who have metrics ranging from extreme old age to potential habitability. Gliese 667Cc is a "super-Earth" that is roughly four times as massive as Earth. It orbits a red dwarf called Gliese 667C; the star is part of a three-star system that is only 22 light-years away from Earth. The planet is considered potentially habitable, according to the University of Puerto Rico at Arecibo's Planetary Habitability Laboratory. Notably, the same system is also host to two other potentially habitable planets: Gliese 667Ce and Gliese 667Cf, both of which are about 2.7 times the mass of Earth. Among astronomers, "habitability"is often defined as a rocky world that is close enough to its parent star for liquid water to exist on the surface. However, there are likely other metrics that come into play, such as the composition of a planet's atmosphere and the variability of the host star. Scorpius has many bright stars, including Antares (α Sco), Graffias (β1 Sco), Dschubba (δ Sco), Sargas (θ Sco), Shaula (λ Sco), Jabbah (ν Sco), Girtab (ξ Sco), Iclil (π Sco), Alniyat (a name shared by two stars: σ Sco and τ Sco) and Lesath (υ Sco). Antares, also called alpha Scorpii, is a red supergiant and the 16th brightest star, with an apparent magnitude between 0.96 and 1.8. It is part of a binary system, having a faint companion. 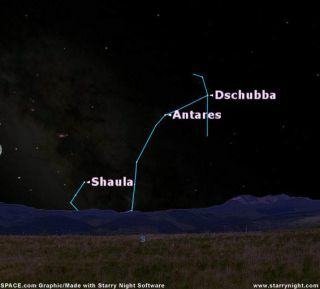 Shaula, also known as Lambda Scorpii, is the second-brightest star in the constellation and the 25th brightest star in the sky, with an apparent magnitude of about 1.63. Astronomers have confirmed it too is made up of two stars, and there could be a third one given that the star system is producing more X-rays than expected. Other binary stars in Scorpius include Beta, Nu, Xi and Sigma Scorpii. The constellation encompasses U Scorpii, one of only 10 known recurring novas, which is the rapid increase in the brightness of a star. While it normally has a magnitude of 18, it reaches a magnitude of about 8 during outbursts, which have been observed in 1863, 1906, 1936, 1979, 1987, 1999 and 2010. Scorpius is also home to four deep space object that were among the first to be catalogued by Charles Messier: M4 (NGC6121); M6 (NGC6405), also called the Butterfly Cluster; M7 (NGC6475); and M80 (NGC6093). Scorpius and Orion are often intertwined in Greek mythology. According to one myth, Orion boasted that he would kill every animal on the earth. The goddess-hunter Artemis and her mother, Leto, dispatched a scorpion to kill Orion. Zeus put the scorpion in the heavens after it won the battle. In another myth, the god Apollo, Artemis's twin brother, grew angry and sent a scorpion to attack Orion because he claimed to be a better hunter than Artemis. Zeus put Orion and Scorpius in the sky, but they are visible at different times of the year. In astrology, which is not a science, the constellation is called Scorpio. It is the eighth sign in the Zodiac and represents those born between Oct. 24 and Nov. 22. The traits of those born under the sign are said to include determination and loyalty. Additional reporting by Elizabeth Howell, Space.com Contributor.